So, I had heard of this show, but I never saw it. However, while flipping through the channels tonight waiting for the new episode of Desperate Housewives, I came across this show “Sister Wives”. 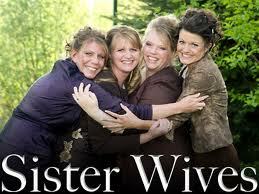 “Sister Wives” is a reality series based around polygamy. For those that don’t know, polygamy is defined as having more than one spouse at a time. “Sister Wives” follows Kody Brown and his 3 wives and 1 wife to be. Kody has 13 children with his 3 wives, and will gain an additional 3 with his wife to be. His first wife (and the only wife that the state of Utah recognizes) is Meri, the second wife is Janelle, the third wife is Christine (who is pregnant with his 13th child during the first season of the show), and the wife to be is Robyn. The show is VERY different, and while I do not understand this lifestyle, the show is VERY addictive. I’m really enjoying it while trying to wrap my mind around it. Tonight is the season finale at 10pm. Looks like it will be a special hour long episode airing on TLC. Have you seen the show? If so, what do you think?